It's been a long time since I've read anything by Beverly Cleary. When I was of the Age of Appeal, I focused primarily on the Ramona series (which were great, and I loved them). I've read some Henry and Ribsy but really nothing else. 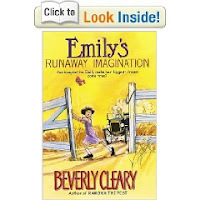 I came across Emily's Runaway Imagination (pub. 1961) in a used bookstore and thought I should probably expand my Cleary experience a little. I'm glad I did. This book is certainly written in a period dated fashion. There is a brief moment where Emily's father might spank her. (No author in their right mind would say that these days.) There is also some "racial profiling" of the Chinese character in the book. (It is assumed that the kind hearted Chinese man will be bringing rice to the church potluck.) I think these two particular things could raise the hackles of a great many groups and organizations these days. It really is something of a pity because Cleary has an innocent way of writing and appealing to a child's imagination that not all authors have. She's clean and innocent and the children who are hers are charmingly lovable. Emily is one such character. 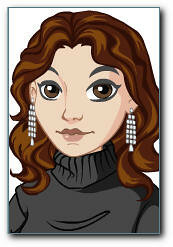 Emily lives in Pitchfork, Oregon, where there is no library but she wishes that there was. The main focus of the book is in bringing a library to Pitchfork for the citizens to enjoy. In the meantime, we bop about town with Emily who is always getting into little scrapes - from correcting Mr. Fong Quock's pronunciation of certain words to bleaching her horse (another thing of angst to the modern day audience). We find her riding her grandfather's Model T and botching up her pies she is baking for the church potluck. She clearly doesn't understand why she amuses the adults in town and they clearly don't know "what's got into her head." But she's cute and adorable and who couldn't help but like her? So I liked this book but it does have "issues" in today's world which is a bit disheartening, whether or not I think they should be. They exist and so you'd have to choose your audience carefully and explain a few things. This book reminded me that every piece of literature, whether it intends to or not, shares history with us. Books mark the passage of time by sharing public opinions or a particular way of life. That's important and that's good. Sometimes it is just hard to deal with. That being said, I recommend Emily along with everything else I've ever read by Cleary. She's charming and I like her. When I was young I never read Beverly Cleary, not even the Ramona books. I'm not sure why, because I clearly remember them all sitting on the library shelf! But recently I read The Girl from Yamhill, Cleary's second volume of memoirs, and I enjoyed it very much. You are so right about the appeal of her writing. This is my all time favourite of Cleary's books! (And I think I've read most of her books) Maybe because I wanted to be a librarian when I was a little girl. I don't like the Ramona ones, even as a child I didn't like them. I liked Henry Huggins much better. I STILL think of this book fondly as an adult. Every time I think about "beauty is in the eye of the beholder", I think of Emily. Thanks for reminding me of her again! Wow, I haven't thought about it in years. I listened to it on audio, and adored it. The horse scenario... *laughs* Cleary's so good. It's hard not to like her even grown up. I loved Beverly Cleary! I grew up around the towns she wrote about, but I especially loved her because she really spoke so well to kids. Wonderful.